Finals are tough, help them survive the long hours of studying with a yummy care package of homemade brownies. Homemade brownie care package. Your day just got a little sweeter or a lot brighter if your Name is on the Nana's shipping label. Nine delicious Nana's best selling old fashioned made from scratch brownies.Yummy flavors may include Plain, Caramel pecan, mint, chocolate chip, peanut butter chocolate chip, milk chocolate, walnut or chocolate fudge. Delicious, moist and oh so craveable. We can customize the flavors to suit your needs. Just leave a message in notes. You will receive Ten individually wrapped brownies made to order with the freshest ingredients. Boxed and ready to enjoy. Will be glad to include a special note for your recipient, please leave message in check out notes or Mark as gift with gift message. 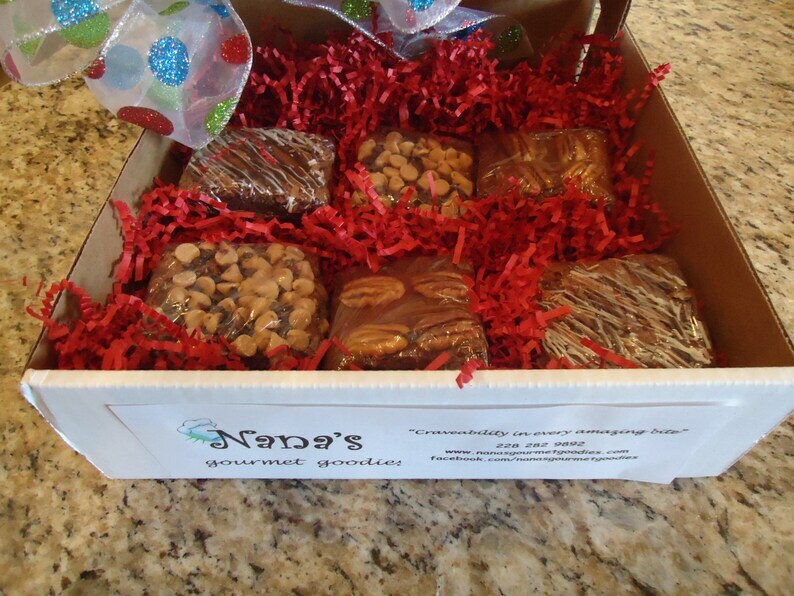 Meet the owners of Nanasgourmetgoodies. My college sophomore loved them. Thank you so much for shipping them so quickly.